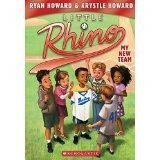 Baseball and bullies is the theme of book one in a new series called, Little Rhino, written by the husband- wife team of Ryan and Krystle Howard. Ryan plays Major League Baseball. Krystle is a former elementary reading teacher. They write authentic dialogue as well as exciting and realistic play-by-play baseball. Both are interested in literacy as well as sports. Team members represent a diversity of children and the main character, Ryan known as Rhino, is taken care of by a single grandparent. But none of that interferes with this great story of being on your first baseball team. Learning how to play together and get along with others solves a bullying problem in a light and realistic manner. Third grade readers will recognize lunch room conversations about dinosaurs, a pestering bully and waiting all day Saturday for it to finally be game time. Full page pen and ink drawings help to break up the chapters while immersing readers in the setting or action. This is a series that third grade readers will enjoy reading and collecting. Having the beginning of the next book included at the end of this book excites readers and gives them something to look forward to reading about. It is also a good marketing plan. Extras: The beginning of Book 2, The Best Bat, is at the back of this title. How very exciting it is to have your teacher getting married! And it couldn’t happen to anyone better than our long- time friend, Horrible Harry. Of course, that in itself would cause many to worry. Things don’t always go well when Harry is involved. His class finds out about her wedding day during a show and tell class but then realize they haven’t been invited. None of them! They do what any reader attached to this series will enjoy. They figure out a way to spy on the wedding from the balcony and then the belfry of the church. 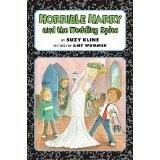 Suzy Kline has again written an entertaining and true to life story that young, but independent readers will enjoy. Her gentle inclusion of everyday struggles in a classroom, like not getting invited to a birthday part, will be familiar to students, but she handles all the incidents with respect and humor. Teachers, parents, or librarians can introduce this book by reading only a portion of it aloud. Literacy skills will be strengthened while children enjoy a fun read. It is also a great book to use for a family couch activity like, you read a page and I’ll read a page. Another way to enjoy it would be to have an older child read it to, or with a younger sibling. Sports heroes are often colorful and have an interesting story to tell. Ted Williams falls into that category. As a child, Ted Williams was skinny and not very muscular, but he wanted to be the best hitter in baseball. Through determination, he practiced every chance he got, swinging the bat long after the other kids had gone home for supper. He swung until his hands bled. He ate to gain weight and exercised to build muscles. His career was first interrupted by World War II and later by the Korean War. He was a very good fighter pilot. But, when he returned, his baseball skills always seemed to pick up where he left off. He led the Red Sox to the World Series and is commemorated in many ways at Fenway Park. In the author’s note, the author points out the conflict Williams had with the media and often with the fans, but those conflicts didn’t lessen his skill on the ball field. And he was dedicated to helping others, especially children. Vivid illustrations make the story come alive, from the fields where he practiced in San Diego to Fenway Park to the airplanes he flew. 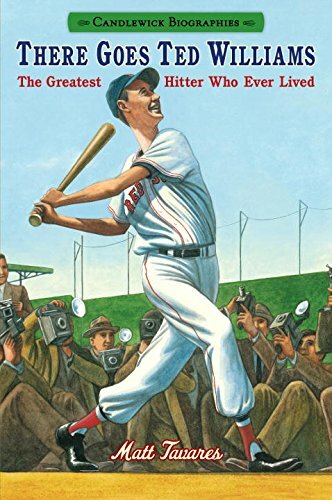 Third grade readers will learn about Ted Williams, history, World War II and the Korean War, sports, and following one’s dreams and talents. This volume of Candlewick Biographies will promote literacy skills and comprehension.